SamFirm is a Small Application for Windows Computer, which allows you to download the Stock Firmware of Samsung Smartphone and Tablets. Here on this page, we have managed to share the latest version of SamFirm Tool along with the previous versions. It comes as a portable application, which means you dont have to install it on your computer to use it. Simply, Download and extract the Tool on your computer and you are ready to download the stock firmware of your Samsung device in no time. It uses very less amount of computer memory while downloading the Samsung stock firmware on the computer. It may use some amount of computer memory to decrypt the firmware on the computer. Decryption process may take minutes to complete. It allows you to download the Samsung Stock Firmware on your Computer, whether it is a md5 or tar firmware. 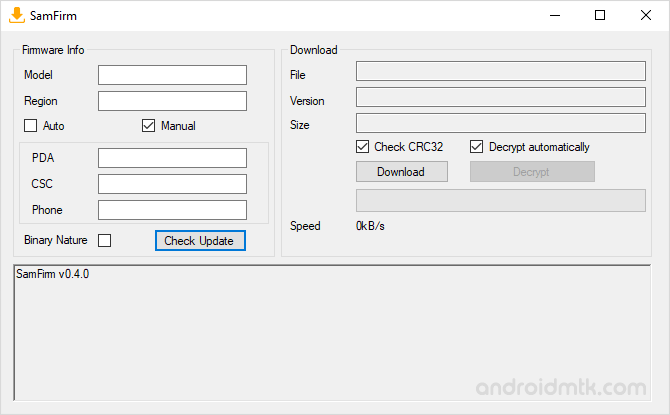 Firstly, the tool download the firmware in encrypted format which can be Decrypt after downloading of the firmware get completed. It allows you to search the Firmware using the Model Number, Region. You can also search the Firmware by Manually entering the PDA, CSC, Phone. It allows you to read the complete name, version and size of the firmware which you are looking for. [*] How to Use: If you want to learn to use the tool to Download the stock firmware, then head over to How to use SamFirm Tool page. [*] Samsung Stock Firmware: If you are looking for Stock Firmware for your Samsung Device then head over to the Download Samsung Stock Firmware (all models) page. [*] Samsung Combination Firmware: If you are looking for Combination Firmware for your Samsung Device then head over to the Download Samsung Combination Firmware (all models) page. [*] Credits: SamFirm was created and distributed by zxz0O0 (xda developer). So, full credits goes to him for sharing the Application for free.